BEST VALUE AT 4 SEASONS AT MANALAPAN--PRISTINE CONDITION--NOTHING TO DO BUT UNPACK. Priced-to-sell, this beautifully maintained 2 Bedroom, 2 Bath with Den has everything you want,including an open space design, and is situated on a professionally landscaped lot. Some design features include: 9' ceilings & beautiful silhouette blinds throughout. Living Room with built-in wall unit w/gas fireplace & TV. Den/office, Kitchen w/pantry, breakfast bar & all appliances. 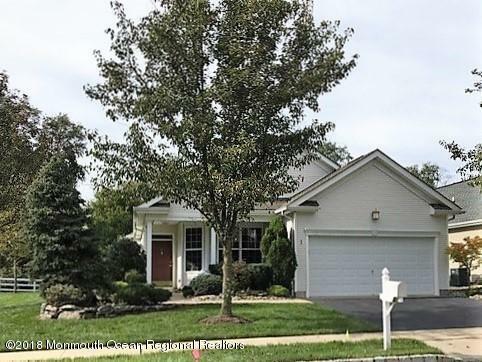 Two large walk-in closets in Master Bdrm & Master Bath w/soaking tub & separate shower. Private Paver Patio w/elec awning & barbeque. This desirable lifestyle community offers a gated entrance, indoor/outdoor pools, tennis, putting green, driving range, bocce court & jogging trail. Quick closing possible.